Window fans come in different sizes to suit your cooling needs. The portability and mobility feature of window fans should not go unnoticed. The size of just about any window fan allows you to conveniently place it in many rooms. Even better, window fans take almost no time to set up, and don't take up a large space. 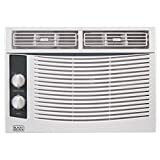 They provide you the cooling benefits of an A/C for a fraction of the cost. In fact, window fans are a perfect substitute for leaving your A/C on regularly, which can save you money on your electric bill every month. The only problem is choosing the right one. That’s why we’ve put this buying guide together for you, to help you with your search. Twin window fan: This fan is ideal to use during rainy weather as its motors are water-resistant. It also has the added benefit of having a comfort control manual thermostat, which sets and maintains an ideal comfort level. Combined with three speed settings, this fan also has an adjustable extender screen and extender panel, which helps secure the fan in larger windows. 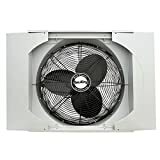 If you’re looking for a fan to be placed in a larger window, or work in the background with little to no intervention, then this is an ideal choice. Whole-house fan: This fan is designed so it can be placed in any room. The industrial grade fan motor means high velocity air circulation with little to no maintenance. It has a front-mounted rotary control to select desired speed. It comes with a 7-foot long power cord, and included is Storm Guard sliding panels. This fan is powerful and is a great choice if you’re looking for multi-room cooling. Remote control fan: This is a cost-efficient solution to traditional air conditioners. There is a digital thermostat, which allows you to set and maintain your comfort level. It also has a quiet and efficient operation that makes this ideal to be placed in a bedroom or living room. Having a remote control adds to the convenience of being able to control the fan from afar. 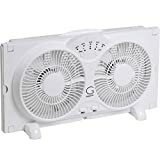 This fan is ideal if you want a quiet and powerful fan that can be controlled using a remote. 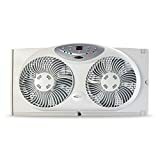 Mini-compact fan: This fan contains an antibacterial mesh filter that reduces bacteria, room odors, and other airborne particles for a healthier and comfortable environment. 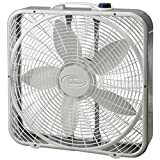 This fan quickly cools a room up to 150 sq. ft. with dehumidification. 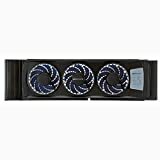 There are 2 cool speeds and 2 fan speeds. Also, should you ever restart the fan, it automatically resumes operating at the previous setting when its power is turned on again. The low power start-up of this fan conserves energy and will save you money. The mini compact fan is perfect if you’re looking for a healthier, and more economical solution. Electrically reversible fan: Reversible fans are unique because they are able to produce a gentle updraft, which forces warm air near the ceiling down into the room. This feature is used ideally during winter. These fans are typically smaller in size and have quiet speeds, making this a great addition to any room. Operation: Window fans that have very simple control settings are valued more by customers. Making sure the window fan you choose isn't overly complicated will help you be satisfied with your purchase. 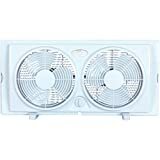 Power/Effectiveness: Powerful window fans that are able to provide the most cooling benefit for customers got the highest reviews. Not surprising, customers are looking for a powerful solution for their cooling needs. Build: Models that are compact and easily placed on window openings are one of the most sought out benefits when purchasing a window fan. 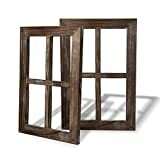 Overall, people who purchased a window fan that seamlessly fit in their homes were happier with their purchase. When buying a window fan, you should first consider what exactly your cooling needs are. 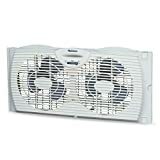 For example, if you only need a window fan for one room, then silent and compact fans are your best choice. The twin window fan and the electrically reversible fan are great choices if it's winter, and you still need the convenience of a small compact fan. Smaller fans also may come with an adjustable extender screen and extender panel to help secure the fan in larger windows. If you need a fan to cool a much larger room, then you would do better with a more powerful fan, such as the whole-house fan. Bionaire: A pioneer in its field, the Bionaire brand believes that if there's a better way out there, it will be the first to find it by imaginatively blending technology and nature, art, and science. Bionaire relentlessly pursues pure perfection for all those who demand pure quality, pure design, and pure simplicity in their home environment in the ultimate quest for pure indoor living. Holmes: Holmes provides products to transform the home environment for enhancement and ultimate comfort in everyday living. Bringing elements of design, performance, and value together in climate control and air quality products, families can depend on the Holmes brand to offer both style and functionality while effectively optimizing their home environment. Air King: Air King has been in business for over forty years and has developed a reputation for manufacturing quality ventilation products, offering products at a great value, and providing excellent service as well.